I’m wondering how a girl who never much cared for Sampler quilts – true story – finds herself with three Sampler quilts “in the works”. And “sew-alongs” – I’m really not sure how it happened but I’m sewing along with a couple of those, and planning one or two for the holidays with friends. Sampler Shuffle. 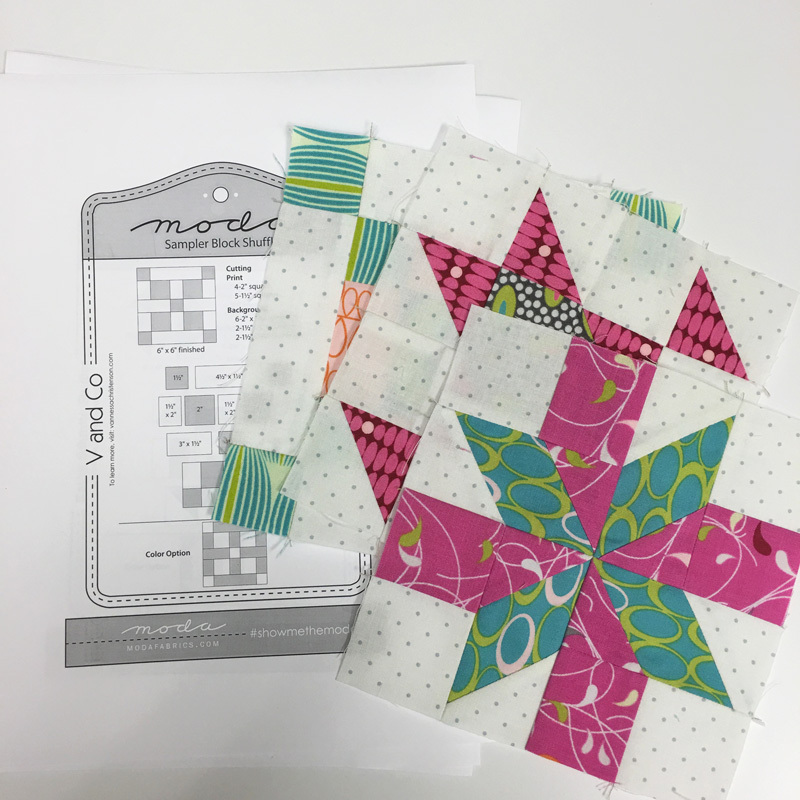 Have you heard of the Moda Sampler Shuffle? These are some of the pictures of blocks that have been popping up on Instagram for #modasamplershuffle. 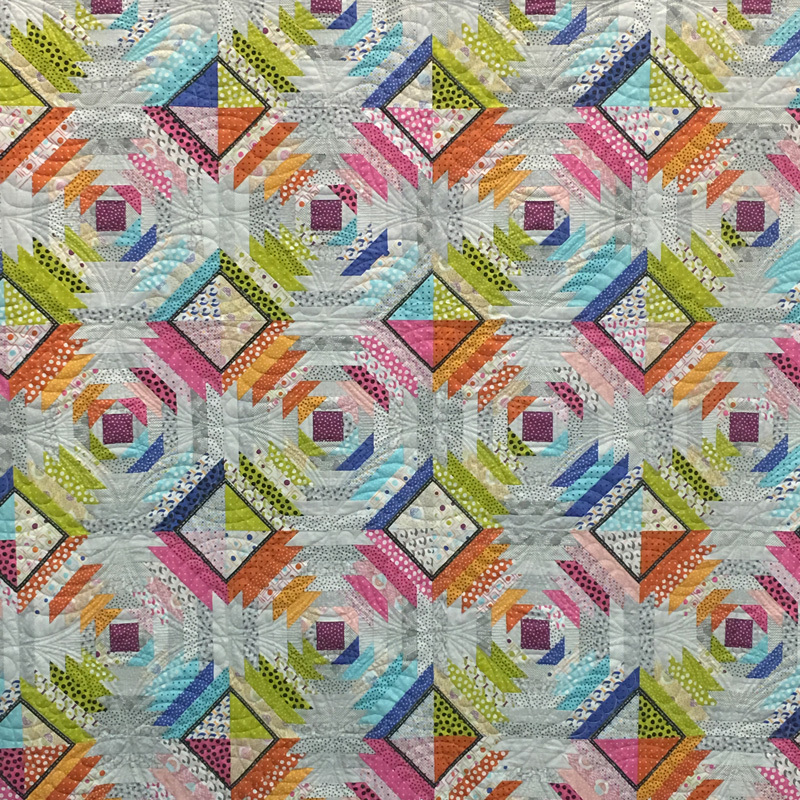 The quilt and blocks were first shown at Spring Quilt Market in Minneapolis – though only twenty-four of the thirty blocks were made available there. It’s sort of like a Block of the Week Times Three – three blocks are “published” each week as a download for participating shops to put on their websites. 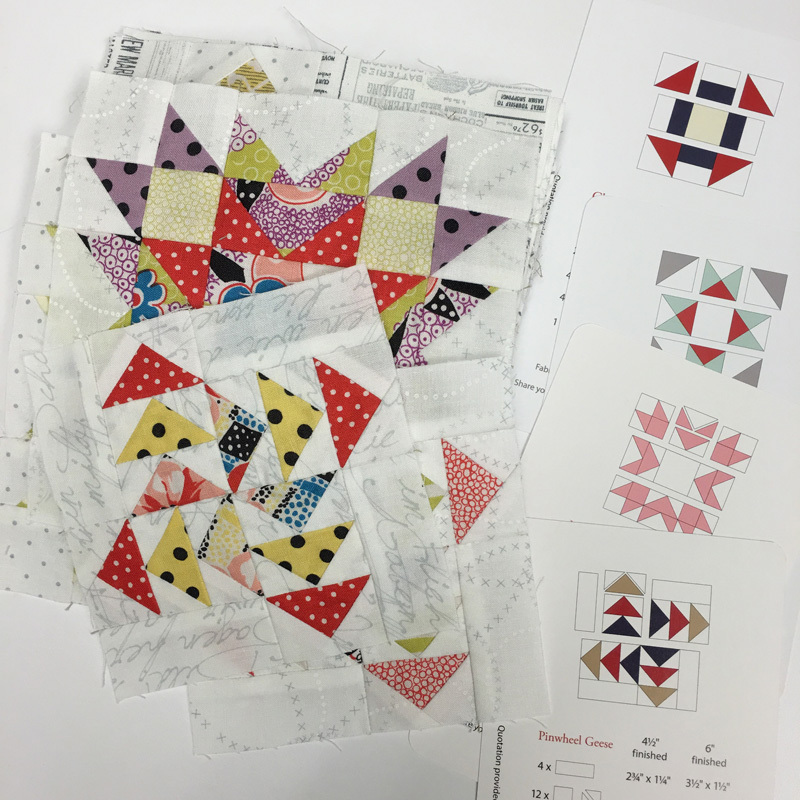 The patterns are free and they’re only available for a limited time so even if you’re not sewing along, you can collect the blocks and quilt pattern to make later. It started two weeks ago – Friday, October 30th – and will continue through the first Friday in January. This is the quilt – these fabrics are from Mille Couleurs by 3 Sisters and Color Daze by Laundry Basket Quilts – Edyta Sitar. These are my blocks – I’ve made the three Week 1 blocks and I’ve gotten as far as printing out the Week 2 patterns. So I’m behind. Except that I’ve pieced all of my flying geese… okay, so they still need to be trimmed to size. But they’re pieced! That counts for something, right? The fabrics are all Zen Chic – For You and Flow for the prints and Modern Backgrounds Paper for the backgrounds. Farmer’s Wife – the 1930s version. 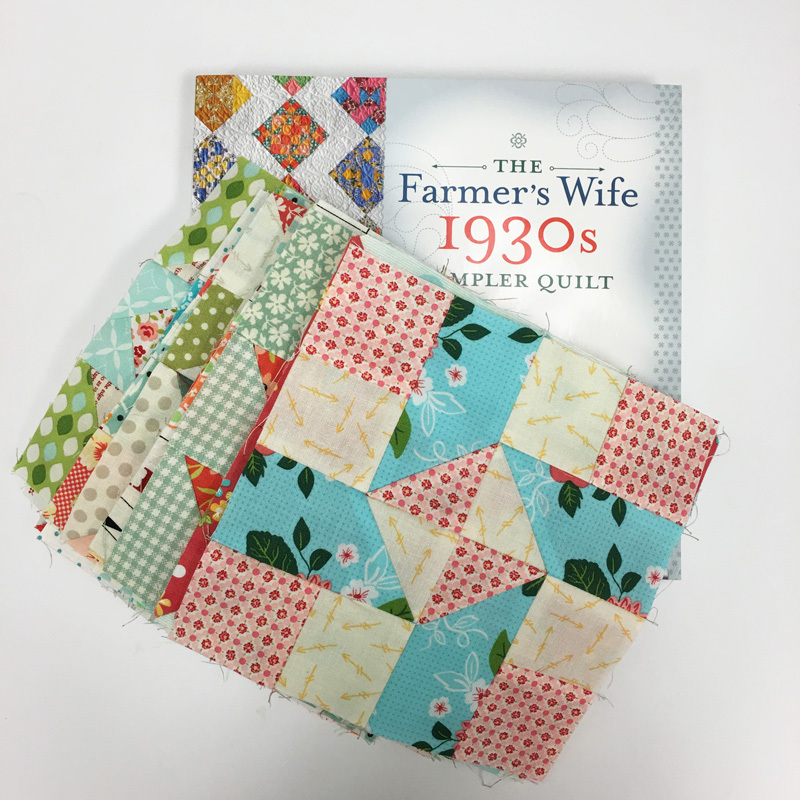 After missing the original Farmer’s Wife book and sew-along, and then seeing all the wonderful quilts, it wasn’t hard to decide to “Wife-along” when several folks teamed up for a 1930s Farmer’s Wife Sew-along. I also managed to convince a few ladies in the office that they should “Wife-along” too – a few are determined to finish the quilts they started for Wife 1. I’m not judging as I expect to finish my quilt in time for the publication of the Third-Cousin-Twice-Removed’s Fourth Wife of the Farmer book. 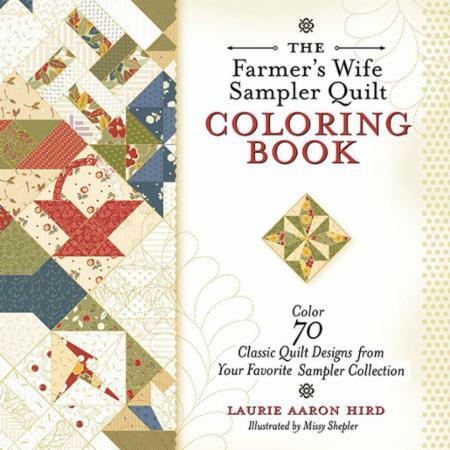 By the way, did you know that there is going to be a Farmer’s Wife Coloring Book – it comes out next Spring? Seventy blocks. I bet I could finish coloring this book before I finish the 99 or 100 blocks for my quilt. The fabrics are mostly Jen Kingwell’s Gardenvale and the backgrounds are from Zen Chic’s Modern Backgrounds Paper – the White. 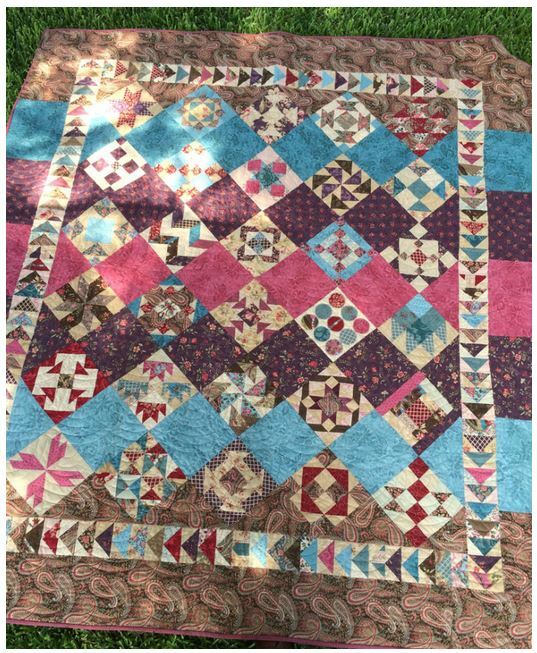 Did you see the pictures of this quilt from Market? It’s the Lollies Pineapple using pieces from Jen Kingwell’s three new collections – Lollies, Just a Speck and Behind the Scenes. Just so you know, I’ll be using different fabric. (I blame my parents.) I don’t know that I’ll get sewing in the next few weeks but I am going to get my fabrics cut. Ready, set, sew! I just might have to copy her… I really like it. So what do you think? Have I bitten off more than I can chew? Am I juggling too many projects? Or does this sound about right to you? I am curious – do you like working on just one project at a time? Or do you prefer to have multiple things going on at one time? Are you thinking of the “next project” – and maybe even starting to get it ready – while you’re sewing? I’d ask you to tell me what you’re working on but I’m easily distracted. I work on one one project at a time but then will add in a block of the month or some other occasional sew along to add in some variety. Working on more than one start-to-finish project at a time seems to upset my “balance” as I like to finish what I start. I’m a freak, right!!?? I am a one-project-at-the-time person. I do think a lot about next projects though and I usually start piecing a second project as soon as I basted the first. In practice this means that I have a hand quilting project as well as a piecing project under my hands, and I try to stay with that method. I am severely tempted to do otherwise, but simply lack the time to do it all at once so I try to limit myself and just write down new ideas (and collect fabric for these ‘once-upon-a-time projects’ ;)). I love that you are able to do it all and I highly enjoy reading your blogs and eye-ing your projects. Thank you. Although I am a one-project-at-a-time person, I am guilty of planning the next project while still working on one.I am also guilty of planning small projects in between quilt making. Its a crazy balance! I have become a multi-project person… I just hope that some of them get finished in a reasonable amount of time… because the want to do list is getting longer!! sounds about right….we are like butterflies that flit around. One needs several projects going on at the same time…….different moods, etc, etc….. I usually have four or five projects going at a time. Never get bored that way. Right now I’m working on a really cute American Jane pattern called Petite Petal Points using the charm squares of Lorraine that you sent me. I love it! Thank you again! Your fabrics and projects look lovely. Have fun! what is the name of the black/orange quilt pattern on the table next to the green and red fabric? Love it! Let’s see . . . right now I have a quilt that is being hand quilted for my sister, a quilt top that needs backing pieced for me, and I just started cutting fabric for a quilt for my new nephew who is arriving in March. Plus enough fabric and quilt patterns to last me a lifetime at this rate. Working full time and being a mom and wife doesn’t leave much free time so I like quick projects in between as well for some sense of accomplishment. But, I’m sure all of yours will turn out beautiful…they always seem to be “worth the wait”! I would never disobey Lady Grantham. I am a one project on the table at a time. However my next projects are waiting in the wings, already bought. Then there are those i have actually had to stop, while I work on the current one that has a self imposed deadline for my granddaughter. I promised myself I wouldn’t be a quilter that had 5 quilts going on a one time. That was Jan 2015. That didn’t last long. Oh well. I do love the colors of quilting. I am addicted to the colors. Your projects sound like mine! 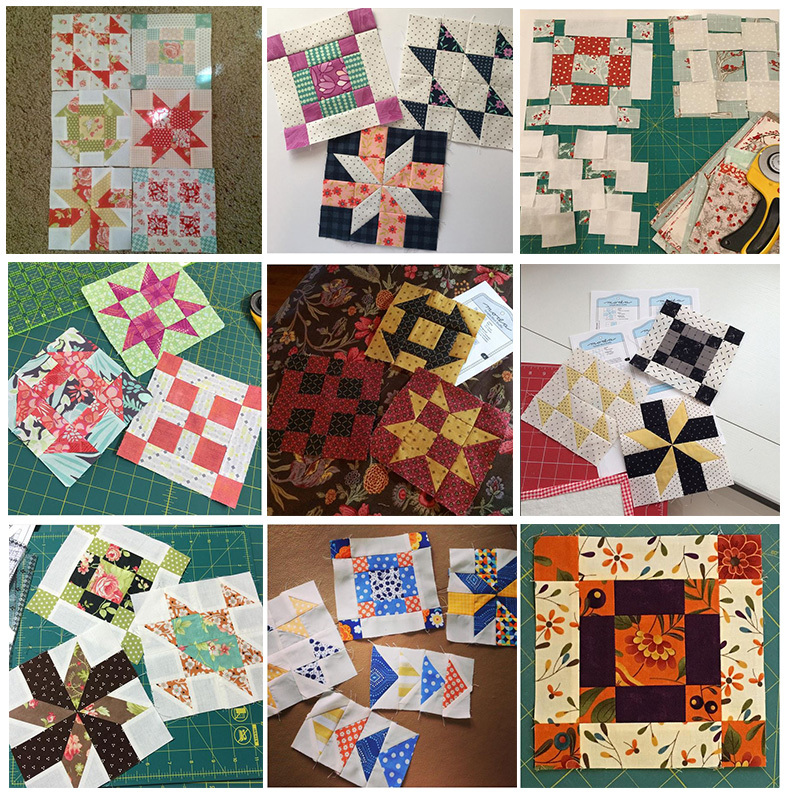 I’m currently doing 3 BOM’s that I ordered-the Gravity quilt, the Fig Tree mystery quilt and the Fat Qtr Shop Designers quilt. Plus some freebies from online-let’s see, the women of the Bible (51 blocks I think and I’ve only got 4 more to go! Then they all go together somehow), the Moda one you talked about, a Christmas applique one that’s small and one from Common Threads Quilting in Texas. Whew! Oh, plus the Frivols. I always say I have the attention span of a 2 year old and need a lot of projects going to maintain my interest! How do find shops that are posting this to their sites to get the blocks? 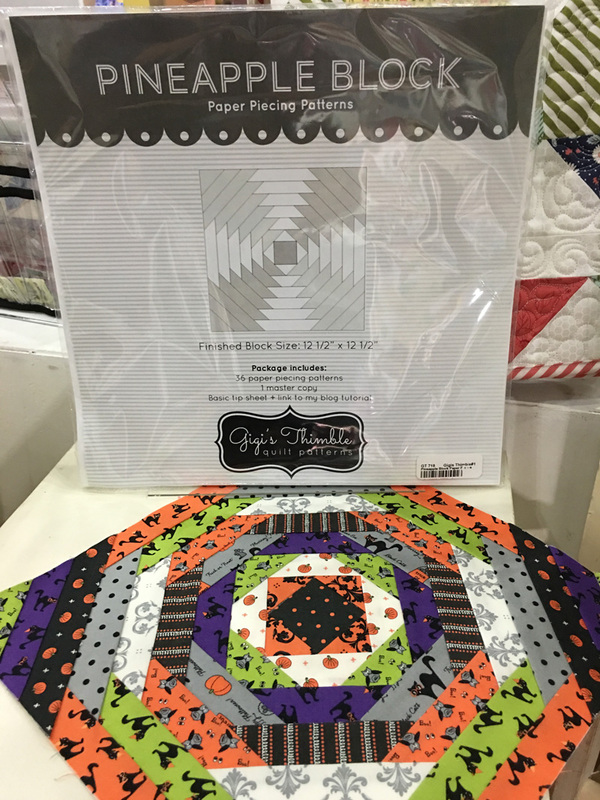 where do you buy the Gigi’s thimble paper piecing patterns? I cannot find them anywhere. I emailed Gigi’s Thimble yesterday as they are not available in her Easy shop. She stated they were making some packaging revisions and will be back in her shop soon. I work on several projects at a time, but I am a hand-quilter so I have to be realistic about how many tops I can sensibly accumulate. But believe me, if I could afford all that fabric, I would have as many projects going as you do! Love your fabric and color choices on all of your projects! I normally have at least 4 projects going at once! Right now, my main concern is sewing 17 pillowcases for Christmas gifts! ( cut out, pinned and ready for sewing!!!!) But, I have cut out a couple of Farmer’s Wife blocks… no sewing yet! Love seeing your inspiration! now in piles….maybe the night time little elves will get a lot done….good luck to all and to all a good nite !!!! I work on several at one time – some get finished and some don’t. However, I would like to know how to find a quilt shop publishing these blocks, as my LQS is obviously not. And I would also like to know how to find other things and materials that my local quilt shop does not decide to carry. And here you go flaunting that pineapple quilt in my face that I have wanted to do like forever. Yes, I have *more than one* going at all times. Guess it’s time to stop and finish up a couple …. nah, never mind! 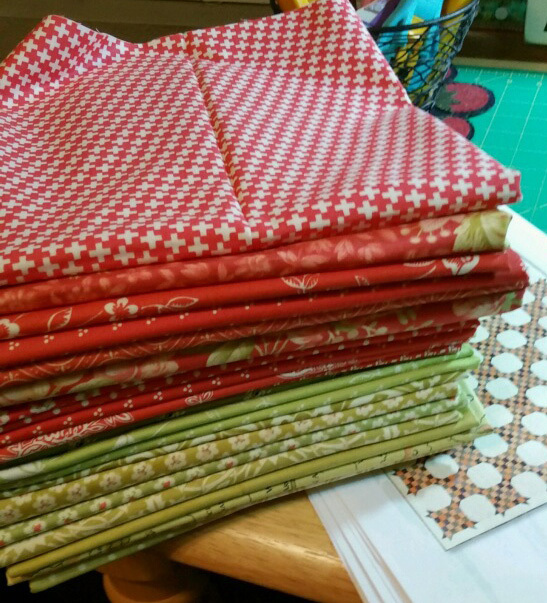 I was just nodding and agreeing and thought I might just take out my patterns and books of the extact same sew alongs, until you got to the red and green bundle and then my heart stopped!!!! This is like an enabler site, I now have to stop everything and make my bundle of that happiness!! Thanks! The more projects going on at one time, the better. I have 2 quilts in production right now. I need to put a border on one and I am working on blocks for the other. I have blocks of the months that are also being worked on. I also have a couple blocks of the month that are waiting for me! And there is all the future projects that I get the patterns and fabric for when I see it! I don’t think anyone who doesn’t quilt would understand!! It all looks like a good time to me! I have to say that I am in love with the red/green Lucy… my heart actually skipped a beat. That one would come first for me! I am definitely a multi project person. Fab Five BOM, Churndash BOM, tree skirt and stockings for my Granddaughter, multiple machine embroidery projects, including ITH nativity set, etc, etc. I would love to be the Farmers wife but later. Love that Pineapple Quilt. can hardly stand it! !- What eye candy, each more gorgeous than the last. Loooove your fabric choices! One at a time for me. I am way to focused to have more than one at a time going on in my sewing room. I become way too distracted and get that ‘in over my head feeling’ when too many things are lined up. But, I am always thinking of the next project! You are way over blocked….. there is a BIG difference between one (?) project and eight…. about a gazillion pieces of fabric, etc. As long as you are having fun we will have fun “watching”. Gorgeous fabrics in each of your blocks and projects–yummy. Where can i retreive the sampler block shuffle patterns?